How to Use Binders is #6 in my blog post series about gluten free baking. If you have been reading a bit you already know that gluten free baking is all about the magic (or science) of what happens with protein and starch. Binders play a small but important part in this magic. 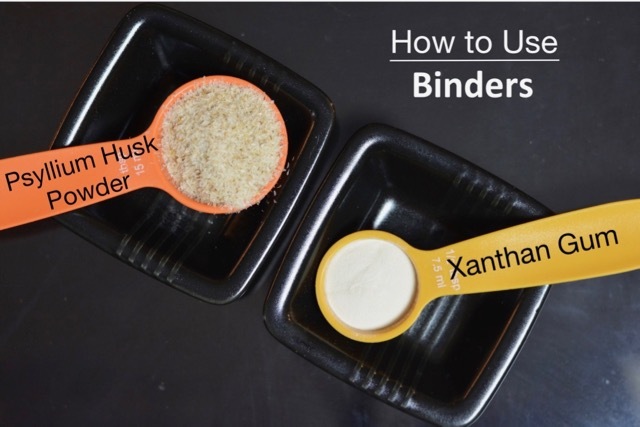 The three most commonly used binders in gluten free recipes are xanthan gum, guar gum and psyllium husk. You don’t need to understand the science of these ingredients to use them but a little bit of knowledge may improve your gluten free baking and result in more happiness in your kitchen. The main protein strands in wheat flour, glutenin and gliadin, are wrapped around starch granules. When water is added these strands unwind and connect to form a network called gluten. The ingredients used in gluten free baking are to create a similar network without gluten. 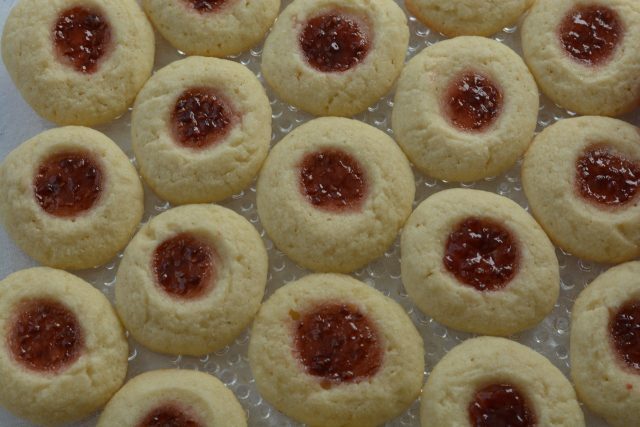 As the name implies binders bind protein and starch molecules together to give structure to baked goods. Gluten free flours are not capable of forming the network for this structure. Binders are therefore used to create and strengthen the protein networks in the different flours used in gluten free baking. Sometimes referred to as the glue that holds everything together, binders help to prevent your muffin or slice of bread from falling apart when you touch it. Xanthan gum is corn based. It is commercially used as a thickener and stabilizer in ingredients from toothpaste to salad dressing. For the gluten free baker it plays two important roles. Xanthan gum strengthens the protein networks and makes them more elastic. Both Bob’s Red Mill and Judee’s sell xanthan gum online. Some people cannot tolerate xanthan gum so guar gum is a reasonable substitute. Others have determined that their tummies are happier when they do not eat any gums at all. It has a shelf life and is best stored in the fridge or freezer. All gluten free baked goods. Made from guar seeds this powder is high in fiber and is used as a laxative. Like xanthan gum it adds structure to baked goods. Both Bob’s Red Mill and Judee’s sell guar gum online. Imparts a slightly starchy texture to baked goods. According to America’s Test Kitchen cookbook, How Can It Be Gluten Free, guar gum does not perform as well as xanthan gum. They do more extensive testing than any home cook could ever do so I’m happy to follow their recommendation and use xanthan gum in my recipes. Psyllium is a major component in laxatives. Psyllium husk powder or powdered psyllium husk, has a high viscosity so is able to bind water more effectively than xanthan gum. Psyllium husk powder creates a sturdy network with the proteins in gluten free flours and adds a wheat flavour to baking that works well in yeast breads. Both Healthworks and Viva Naturals sell psyllium husk powder online. The wheat flavour in not desirable in baked goods like muffins and cookies. A larger amount is required and this volume does not work in many gluten free baked goods. Yeast breads and pizza dough. Is There A Binder in My Gluten Free Flour Mix? Adding the exact amount of xanthan gum needed to each recipe will yield the best results. For this reason a gluten free flour mix, homemade or store bought, is best without a binder. A good rule of thumb is to add ¼ teaspoon of xanthan gum for every 1 cup of gluten free flour. This is the sixth in a series of blog posts on gluten free flours. My intention is to provide a basic overview of several gluten free flours for the everyday home cook, both new and experienced. Let me know in the comments below if you have a specific problem with your baking or a tip you’d like to share. Anastasia, thank you so much for taking the time to tell me about that mistake. That’s worse than a typo but it’s fixed now. Happy reading and baking!